Prior to painting: Lawn should be mowed, dry and free of debris prior to application. Mixing Instructions:In a 2 gallon garden pump sprayer (Available at all home improvement and hardware stores) mix 1 part LawnLift™ with 6 parts of water. Seal sprayer and shake vigorously. 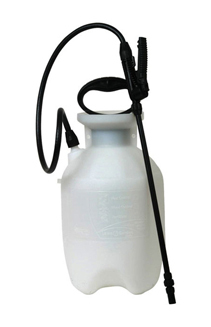 Pump sprayer fully and spray a small amount to check the shade. At this dilution the color may be too dark for some individuals or just right for others. If you feel the shade is too dark add 1 additional part water (at a time) until desired shade is achieved. Most consumers preference is between a 1-6 and 1-8 dilution ratio. However other may prefer an even lighter shade at 1-10, etc. It is always easier to add more water than it is product so this is the reason we have you start at a 1-6 ratio. Tips: You are encouraged to experiment in small areas until your desired shade is achieved. Once desired shade is achieved spray in a random orbital pattern to avoid lines and to create a more realistic look. Keep sprayer head within 6 inches of grass blades. Due to the natural makeup of Lawnlift and for best outcome it is recommended that you shake the sprayer prior to application and periodically during the process to avoid settling of pigment and or clogging the nozzle. Always have the sprayer set to the finest mist setting you can. This will insure the highest and best use. You want to avoid sputtering due to low pressure or streaming the product as you will unnecessarily waste the product spraying in that manner. It is recommended that after you have painted the lawn you unscrew the sprayer tip and clean it. Also please rinse out your sprayer unit until only clear water is coming out of the tip once pumped up. This will insure a longer pump life for your next use. Avoid walking onto the concrete, patio, etc with shoes that have wet paint on them. Make sure your shoes are dry before walking out of the treated area. To avoid overspray on the edge of the concrete closest to the grass spray toward the lawn at close range with a STEADY hand. Or pour some of the lawnlift into a hand pump sprayer (any old spray bottle) and get closer to the lawn to spray. Please take your time and spray smart to avoid accidental overspray, tracking with wet shoes or spilling the product. Do not spray in windy or wet conditions. Please mask off any areas you do not wish to have overspray on and always wear protective clothing and old shoes because they could get stained. It is recommended that you wear protective eyewear, gloves and a breathing mask as the product can irritate some individuals. Do not spray with other present unless they are also protected. And as with any non-edible liquid, keep out of reach of children. Since accidental overspray can occur it is recommended to have a bucket of soapy water available with a nylon or light (bbq style) wire brush to remove any overspray on concrete, etc. Windex also works very well at removing product that was applied accidentally to any hard surface, such as concrete or bricks. Drying time is on average 30 minutes assuming the sun is out. Drying time can be greatly affected by gloomy, overcast conditions or if moisture is present so test area prior to having anyone walk over the lawn. Please remember, Lawnlift is an instant cosmetic solution to yellowed grass. It is not a miracle worker. It will not resurrect dead grass and it will not work on weeds, crab grass, dirt or any other foreign ground cover other than grass. Coverage: Since things like dilution ratio, condition of grass, grass length, type of application, manner of application and desired shade are out of our control we cannot guarantee coverage areas. We can only give you our “average” coverage areas from our own independent testing. Obviously if the grass completely yellowed and crispy, or you prefer a darker shade it will not go as far as a lawn that is fading or the preferred shade is lighter. Longevity: If your lawn is still growing and you mow away the colored area it will only last as long as it takes to mow away the area that was colored. In ideal, dry climates with dormant lawn conditions, where the lawn is still pliable (not crispy) we have had the paint last up to 6 months. Longevity depends on the condition of the lawn, the type of lawn, the weather you have, the traffic your lawn takes, etc, etc. There are just too many variables that are out of our control to give any specific ranges or guarantees. With that being said, most of our client give us a “color life” range of between 1-3 months. Lawn painting is an easy and fun solution to many common lawn problems. 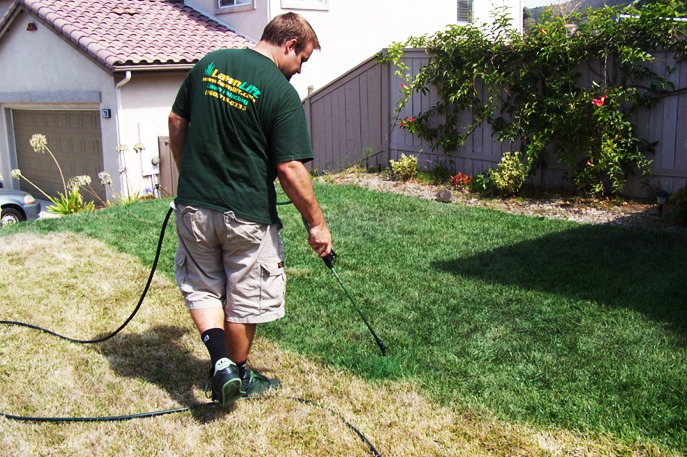 If you know what to expect before you start spraying and you follow the above directions your lawn painting will go much more smoothly for you than if you do not. 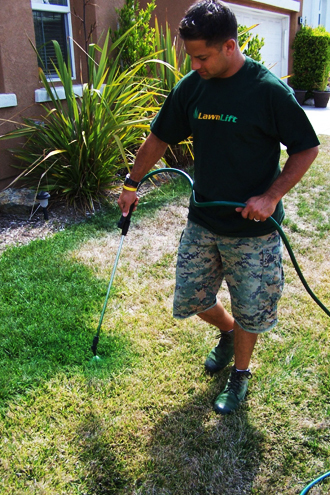 And as always, if you have any questions please call our Lawnlift hotline at 760-822-6604 M-F 9:00 a.m. – 5:00 p.m. PST. Notice: There are no warranties which extend beyond the description on the label hereof. The manufacturer, JDP, LLC DBA Lawnlift, warrants this product to be as described on the label. The manufacturer's liability on this warranty is limited to return of the purchase price of this product. The buyer assumes all risks and liability resulting from the use of this product, whether used singly or in combination with other goods. The manufacturer neither assumes nor authorizes any person to assume for it any other liability in connection with the sale or use of this product. The information is furnished without warranty, representation, inducement or license of any kind, except that it is accurate to the best of JDP, LLC’s DBA Lawnlift’s knowledge. Because use conditions and applicable laws may differ from one location to another and may change with time, recipient is responsible for determining whether the information is appropriate for recipient’s use. Since JDP, LLC’s DBA Lawnlift has no control over how this information may be ultimately used, all liability is expressly disclaimed and JDP, LLC’s DBA Lawnlift assumes no liability.